Self locking hook prevents loads from falling off by keeping them in place with the help of a lock-mechanism. Is one of many key options for both CLX & SLX. Available for CLX02 and CLX05. Extended ambient temparetayure range makes it possible to use the SLX in demanding work environments. 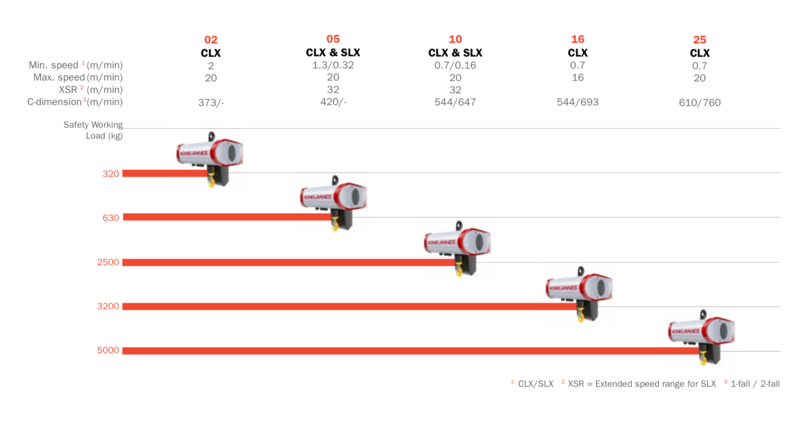 Extended speed range for SLX provides enhanced performance due to optimal speed for differing loads. Electronic overload device sense how much current is drawn by the motor and disengage the hoist when the current draw indicates excessive force. Programmable limits will allow you to optimize your lifting envelope to reduce cycle times and at the same time address the issue of improperly using the standard upper limit as a means of stopping the hoist (dangerous!). A programmable limit switch can be an operating limit which provides additional protection to the worker, product, and surrounding area. New technology has also given us slack chain detection which will reduce the risk of twisted chain, protect sensitive parts being handled with a heavy below the hook attachment, and most importantly, reduce the potential risk of injury when too much chain is inadvertently drawn out by the operator. These risks can and have resulted in the sudden dropping of the load but can be avoided with this new technology. The shock load absorption is an additional equipment which reduces the effects of shock loads and protects both the operator and the equipment. integrated pulse sensors help you monitor your crane operations, ensuring even higher safety at your workstation. The inverter motor of the SLX allows for fine positioning of the load and decreased start stops which extends the life of the equipment and reduces operator strain. Award winner for a reason.